March 1 is still winter, supposedly, but it sure felt like spring in the Willamette Valley, and that called for the obligatory bike ride on the abandoned roads of the former Camp Adair. Well, almost abandoned roads. On my visit to the former military post, now the E.E Wilson Wildlife Area, I spotted a pickup truck in the distance in an area normally off limits to motor vehicles. 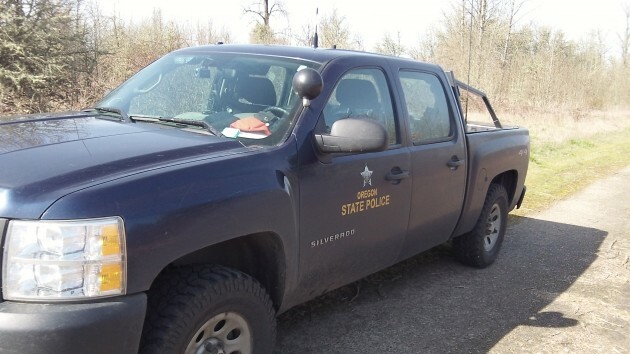 Turns out it was an Oregon State Police rig. The trooper driving it, most likely part of the OSP wildlife section, was not around when I passed the pickup, so I couldn’t ask what caused a state police patrol to venture into the wilds of E.E. Wilson on a Sunday afternoon. As I may have mentioned here before, this area west of Albany in northern Benton County is a great place for walks or bike rides away from traffic. But if you park there, in one of the lots off Camp Adair Road, you’ll need an ODFW parking permit or risk being cited for a violation of wildlife laws. It was the first tike in years — ever, actually — I had seen an OSP vehicle in that area. Good to see you out on this great, almost spring, day Hasso. Thanks for sharing the views.